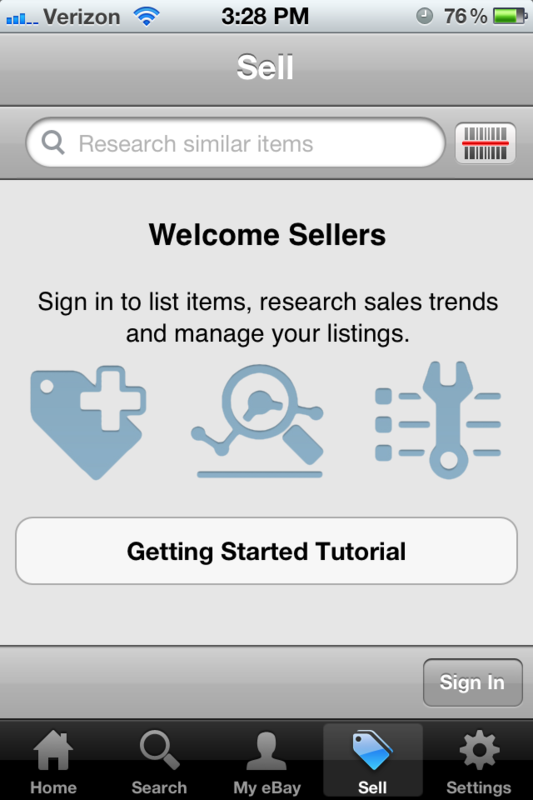 Ebay Vs. Amazon Mobile - Which App Should You Shop With? Ebay Vs. Amazon – Which App Should You Shop With? When it comes to shopping online you have a stunning amount of options to choose from, but do you really want to just shop from your browser. A surprising number of sites are not optimized for mobile, and even the ones that are can’t beat a good app. After all an app, built specifically for your iPhone or iPad can help you to get the most out of your shopping experience. This way they can work with the known specifications of a device, instead of just guessing at what features you may, or may not have, on any number of other mobile devices. So an app is, generally speaking, going to be better. Then, there is the not so little matter of security to deal with. After all putting your credit card number online deserves a little but of respect. A scammer can do a startling amount of damage with that number and you could be dealing with the problems to your credit history for a long time to come. When it comes to shopping the different between eBay and Amazon seems like one personal preference, and in the end, it may be one, but the question you want to ask yourself is what happens when there is a problem with your order. With eBay, you could be largely on your own. eBay sellers are allowed to have their own return policies. Some of them have a police of no returns, even on some very large orders. Since you may be getting used items, and quality could be a problem, having a no return policy when merchandise can’t be examined is a real issue. That having been said eBay does have PayPal on its side, which gives you some protection if an item never comes or if you have real problems. It is also a good tool in helping kids to manage their online shopping, should you want to give them that kind of access. Of course, you could get a PayPal debit card, but that comes with extra fees of its own. As for inventory items, you will be able to find most of what you want. Amazon may have some exclusives in the media department, but since that is all streaming you might be better off not using those purchases unless you have an unlimited data plan or find yourself in a Wi-Fi zone. Yes, for the most part, we are talking about orders that will ship to you, but ignoring the digital products would be pointless, after all, songs, TV shows or movies may be what you are in the mood to buy. With eBay, you will have the choice to either try to get the best price with the auctions or Buy it Now for a flat rate price. If you already use Amazon then you know that the options with Amazon are all about the single price option. So why has the best prices, well that depends on what you are going to buy. As with any shopping, you are going to have to compare. On the bright side, you are going to get the best chance to compare your rates with both apps. 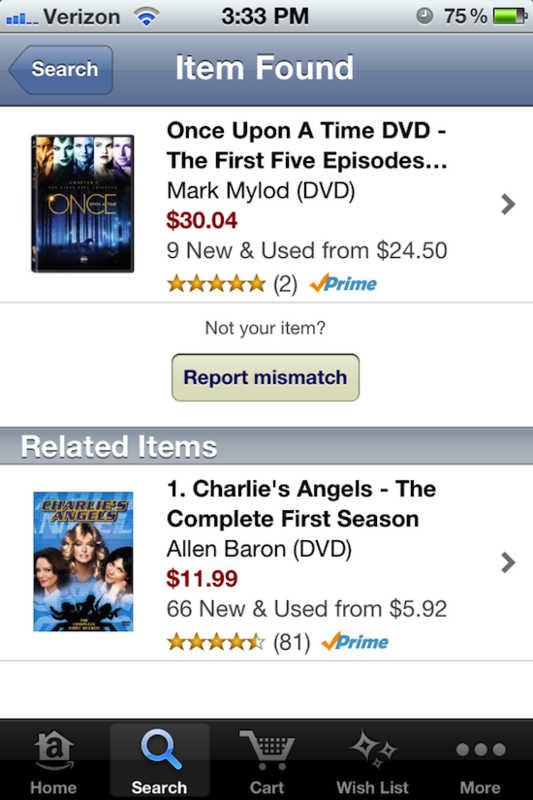 Of course, if you are an Amazon Prime member you may get a better price from that alone. Don’t forget that when you shop online shipping is a real issue and you need to factor in those costs. The scanning sections on both of the apps work well. The apps each have their own version of the scanners that allow you to find products without the hassle of typing in a lengthy name. 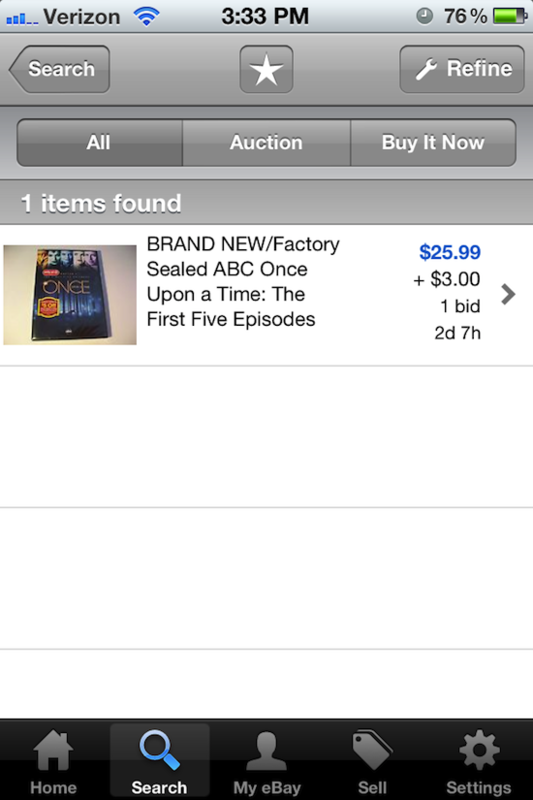 The eBay application has a simple barcode scanner and it works very well with standard barcodes. 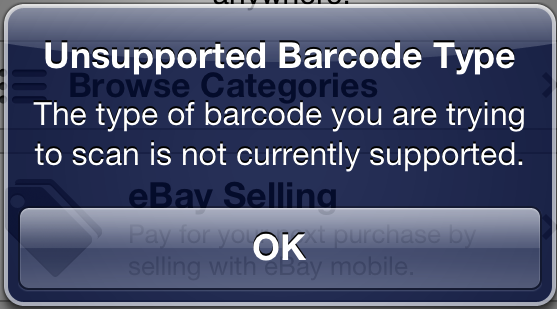 Using any special in-store barcodes or used product barcodes (like the kind you find on used media from places like FYE) is, of course, not going to work for either of the apps. That having been said the scanner worked very well. Checking it out with mass merchandise items it works well. If its indy and on Amazon, you won’t have any other problems finding it, but the true underground stuff may be hard, but you need to be aware of it. Depending on your taste you will have a harder or easier time finding what you want. 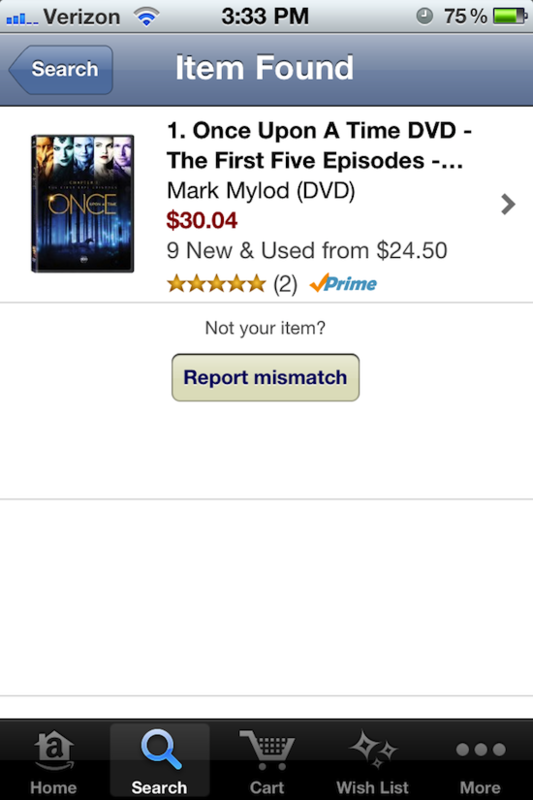 With Amazon you have two choices, you have the ability scan it with a barcode, or you can use the snap it option. The snap it option allows you to take a photo of what you want without using the barcode. That’s good news for something you can’t get your hands on right away, like that rare comic behind the glass at the shop or the expensive items hidden behind the case. The only thing to know about the snap it options is that it works best for media like books, TV show boxes, movie, CDs and the like. On the whole, you won’t be able to use it with that cool shirt your friend is wearing, but you can try it with their media to get a better deal. Just be aware that snap it can give you some odd things in the ‘Related Results’ category. The barcode scanner will give your reliable results without a lot of the wacky suggestions. If you want to look at it from the sellers’ point of view then you have to know that eBay is your only choice. Amazon does not allow for selling with an app. So, keep an eye on your end goal when you choose an app. If you’re looking to sell then your choice is very limited. If this is not an issue then you can choose between the two. So if you want to shop either one is at your disposal, but f you want to be able to sell, or find something without a barcode then Amazon is the app to go with. If however your budget is your bottom line and you want to be able to bid so that you can get the best price then it has to be eBay all the way. In the end, the decision is up to you, but the good news is that you do not have to choose one. You can use them both, each for a different need.